What is the Bloggers’ Café? 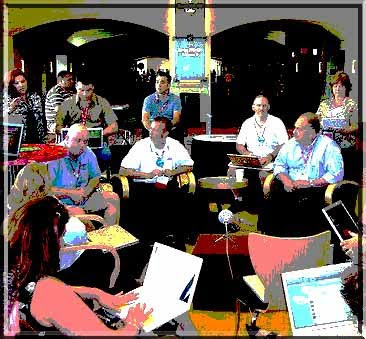 The Bloggers' Cafe is the coolest place to hang out at any Ed Tech conference! This was the "the place to be" hub @NECC09! This is where all the cool peeps are going to chill...once you're there anyway why not stand up and share? In a low key, high-tech, beatnik kinda way - beret & goatee optional. Are you attending the 2009 AASL National Conference in Charlotte, NC? Have something to share, but for whatever reason you are not scheduled for a concurrent session? Consider signing up to present your stuff at our Bloggers’ Café! Presentation equipment and Internet connection will be available. Want to take a comfortable break from the conference hubbub? Stop by and listen as your colleagues share their ideas at the Bloggers’ Café. Sign up now by visiting http://aaslbloggerscafe.wikispaces.com/! Credits: Thanks to Joyce & Buffy for some of the better wordage & Hepcat Darren Draper for the way cool orig pic that i totally posterized..thanks, dude...you rule! Did You Know 4.0 & Where Are We Going? GoAnimate.com: MHMS Media Center Adventures! NEW Animoto: Get JAZZED for AASL2009! #AASL09: Rev Up & Go!